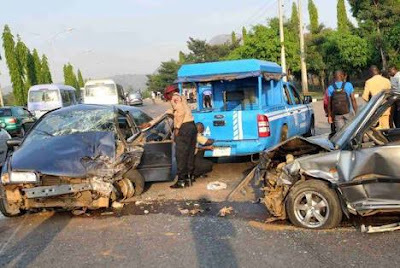 Two clerics and six others have reportedly died following multiple road crashes that happened in parts of Anambra State at the weekend. At Ogidi, in Idemili North area of the state, there was a multiple fatal motor accident on the Enugu/Onitsha Expressway by Tarzan Junction. Mark Truck with registration number, Anambra, AGU 465 YV, loaded with scraps and driven by one Odinaka Igwe had brakes failure, while descending the Afor Nkpor slope and rammed into six vehicles. The Police Public Relations Officer in the state, Mr Haruna Mohammed, confirmed the incident. He said, “Police patrol team attached to Ogidi division visited the scene and rushed casualties to various hospitals for treatment. He said other casualties in the accident sustained injuries and were receiving treatment at a hospital in Iyi Enu. He said the victims’corpses were deposited at the hospital morgue for postmortem while the truck driver was arrested and detained. Mohammed said, “There was another accident on the Isoufia/Igbokwu Road, involving a Mercedes Benz 911 truck, with registration number XY 546 KSF, driven by one Sunday Azidiegwa of Ezioko, Oko village in the Orumba North LGA of Anambra State and one unregistered Honda motorcycle. “The accident occurred when the tipper crushed a four-year-old son of the motorcycle rider, named Praise Umeasuobi, who fell down on the road while the motorcycle was in motion. He said the truck was set ablaze by an angry mob before the arrival of the police patrol team. Mohammed said the situation was, however, brought under control, while the truck driver was rescued and detained. The PPRO added that in another crash, three lives were lost, while five others who sustained varying degrees of injury were rushed to hospitals in the area.